The notion of having a Family Trust is viewed by many as too complicated, prone to high risk, a facilitator of family disputes and with little to ultimately gain in financial terms. There have also been a number of high profile cases in the public domain of Family Trusts that have not been set up or managed properly, at times leading to significant tax penalties and family disputes for those involved. However, it need not be that way. For those who set a Family Trust properly , it is considered one of the best legal tools to help better distribute the wealth of the family and make substantial tax savings at the same time. And in times of separation, family disunity or conflicts, a Family Trust can also play a vital role in the protection of assets. 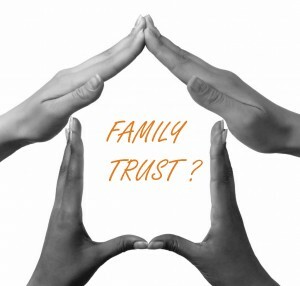 In Part 1 of this Article we will try to understand what a family trust is and its advantages. In Part 2 we will look at the tool box required to set up a family trust and the possible pitfalls to avoid. A family trust could be loosely understood as a mechanism used to collect money and assets for the benefit of the family members. Hence, the assets in the family trust may it be cash or property, is not held in any individual names of family members but are held in the trust. TRUST DEED: A trust is created by drawing a “Trust Deed”. The Trust deed states the terms and conditions under which a family trust is established and maintained. Importantly this deed sets out the powers of the Trutees as well. This is usually drafted by a lawyer after discussing the purpose of the trust with their clients. The trust is established by the trust’s “Settlor” and “Trustee” (or trustees) signing the trust deed, and the settlor giving the trust property (the “settled sum”) to the trustee. SETTLOR: The “Settlor’s” function is to give the assets to the trustee to hold for the benefit of the trust’s beneficiaries on the terms and conditions set out in the trust deed. The settlor executes the trust deed and then, generally, has no further involvement in the trust. TRUSTEE: The “Trustee” is responsible for the trust and its assets. The trustee has broad powers to conduct the trust, and manage its assets but limited to the terms and conditions stipulated in the trust deed. In a family trust, the trustees are usually the parents (or a company of which either both or one of the parents is a major shareholders and/or director). Their children and any other dependants are usually listed as beneficiaries. How Does a Trust Become Recognised as a Family Trust for the Purpose of Tax Law? To be treated as a family trust for tax purposes, the trustees have to complete a ‘Family Trust Election’ (FTE) and limit the beneficiaries to eligible family members. The FTE must nominate a ‘test individual’ who is to benefit from the trust and specify an income year in which the trust is to start. In addition to making an FTE, specific provisions need to be included in the trust deed that provides the trustees with their discretionary powers and ensure the beneficiaries do not have a fixed entitlement to income and capital from the trust. What are the Advantages of a Family Trust? The more obvious advantage accountants and financial advisers emphasise are its tax advantages. Whilst this is very important, one should not lose sight of the other advantages of easier distribution of wealth. In this section I will discuss both these aspects. A family trust could help the family to distribute their income in a manner which ensures that the tax liability of the family as a whole are reduced. It could act as a device to plan the distribution of the estate at death. It can also assist in protecting the family group’s assets from the liabilities of one or more of the family members (for instance, in the event of a family member’s bankruptcy or insolvency). A method of assisting family members with lesser assets as retirement plan. Let’s discuss some of these in greater detail. 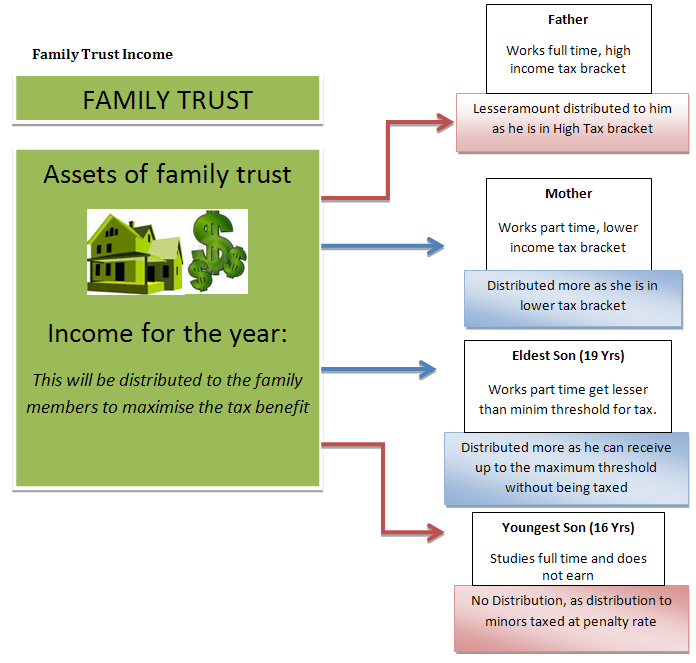 The above diagram depicts the way in which the income and the tax structure works in a Family Trust. The Trust could be used to own assets like the house or shares etc. The income the trust receives should be distributed to family members in the proportion the trustees may decide. a) Make sure that all income is distributed: A trust itself does not have to pay income tax on income that is distributed to the beneficiaries, but does have to pay tax on undistributed income. Undistributed income is taxed in the hands of the trustee at the top marginal tax rate plus medicare levy which is 46.5% in the current financial year. A trust itself does not have to pay income tax on income that is distributed to the beneficiaries, but does have to pay tax on undistributed income. b) The proportion of distribution should best be considered in line with the receiver’s marginal tax rate – in the previous example the father is the high income earner. Hence, its best to distribute more to the wife who is only working part-time. c) Do not make distributions to non-family members and try to avoid minors – It goes without saying a family trust needs to ensure that they satisfy the family trust election (FTE). Therefore, it can only be distributed to the family members. However, if the family member is a minor, any distributions made to the minor will also be taxed at penalty tax rates and should be avoided. Distributions received from a trust are not a special form of income, but instead forms part of a beneficiary’s assessable income. If the beneficiary receives income from other sources in addition to distributions from the trust, all of the income will be taxed together. On a separate note, one must bear in mind that there is capital gains tax on sale of assets by the Trust. However, there is a 50 per cent discount on realised capital gains where trust assets have been held for more than 12 months. Trust beneficiaries are generally required to submit a tax return, unless they are eligible for an exemption, and the trustees should provide details of the income distributions to beneficiaries to assist with their tax affairs. Some wealthy parents who have children who are viewed as spendthrifts or prodigals prefer to leave their assets in family trust rather than bequeathing them by will. They usually prefer to establish a trust upon their death naming a matured friend or relative as the trustee so that they can devise the money to their children based on their needs, rather than allowing the children to reach it as a lump sum. In the event there is already a family trust in place, the beneficiary must remember that he or she cannot bequeath trust property by his/ her last will. The trust property as we have discussed earlier is not actually of the beneficiary but only of the trustee. What happens to the trust property or the portion of income to the beneficiary upon the death of the beneficiary will only be decided by the Trust Deed for the Family Trust and not the last will of the beneficiary. Asset protection becomes distinctly important in two instances i.e bankruptcy and family breakdown. Yet again, it is important to remember that the Courts have the right to decide otherwise should the Courts feel that the Trust was created simply for the purpose of avoiding an equitable distribution of assets at any time. Assets held in a family trust are held separately from any beneficiary, so they are generally protected from creditors. This can provide asset protection for clients who run their own business, have personal risk exposure through their employment or have given personal guarantees for loans. However, where assets are transferred into the trust to defeat creditors, these assets may be available to a bankruptcy trustee. Also, despite the general protection of assets from creditors, trustees may still be liable for any actions or personal guarantees. If a beneficiary is involved in a relationship breakdown, the trustee could exercise their discretion to direct trust distributions away from this beneficiary to reduce the property and income that would be divisible. Under a family (or discretionary) trust structure, investment assets are held by a trustee. Trustees can pass assets or trust income at their discretion to particular beneficiaries, which could potentially include everyone in a family group. As we discussed, a family trust is a great tool to have to ensure that wealth is distributed in an efficient and economic manner. However, because of the controversies surrounding some of its aspects its always better to think through all aspects and advantages in greater detail prior to launching into establishing one. In Part 2 of this Article, we will look at some practical aspects of setting up the trust and possible pitfalls one should avoid.